DEC 30: This event is SOLD out! all spots have been filled and paid -thank you! We are looking forward to another amazing event with you!! Join us for our 6th annual Noon Year’s Eve Party! Music, dancing & play in the Playground, door prizes, party favours for the kids AND a BALLOON DROP at 12 noon! 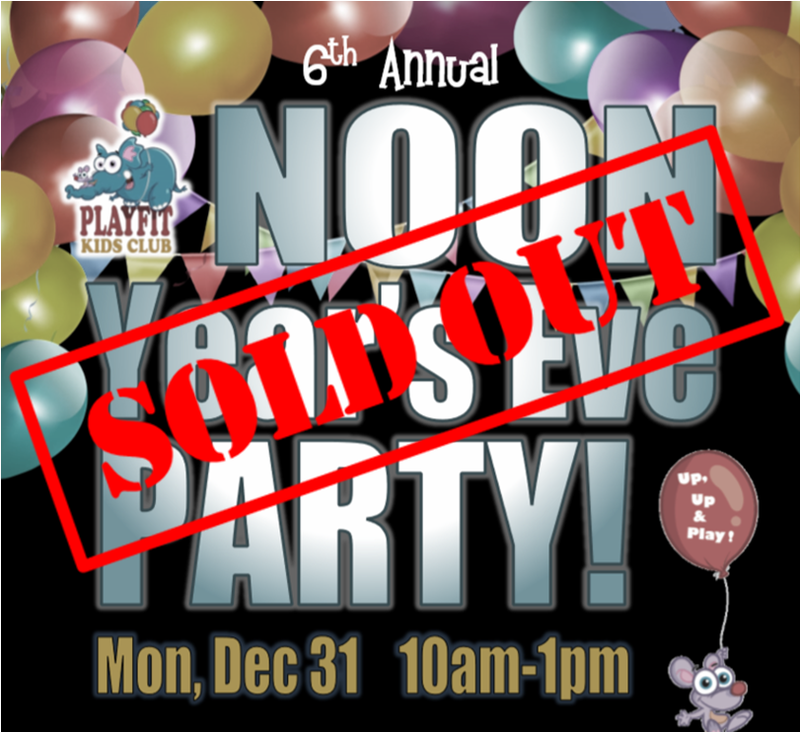 PLAYFIT IS OPEN FOR DROP IN PLAY 1pm-5pm ON monday, december 31. Two adults included per one paid child admission. Additional adults $8+tax. Infants are free with a paid sibling but do not include an adult or favours. Otherwise, $16.50+tax admission applies. VIP memberships, coupons, promotions are not able to be used on this event. Playfit is socks only for everybody; adults included! We do not have a water fountain, but we do have a water bottle refill station! Advanced Registration is required and open for VIP MEMBERS ONLY until November 25. Everyone else is able to start registering on November 27. SPACE IS LIMITED! Coupons, Passes or VIP memberships can not be used for this event. Full payment required at time of registration. Payments are not refundable but are transferable up until December 21; as of December 22, payments are not refundable or transferable.